t’s more than two weeks since a senior Hamas delegation from Gaza arrived in Cairo to meet with Egypt’s General Intelligence (GI) and discuss efforts to resuscitate the reconciliation agreement between Hamas and its rival Fatah. Despite assurances by Hamas officials that the talks have been “positive” there has been no indication that the Egypt-sponsored agreement of October 2017 is moving forwards and no Fatah official has been invited to take part though the Hamas delegation has been joined by several senior officials from the movement based in Turkey and Qatar. According to Hamas spokesman Taher Al-Nunu, expanding the delegation in Cairo has allowed the group’s political bureau, and its leadership in Gaza and in exile, to hold meetings to discuss internal matters. He denied rumours that Cairo was restricting the delegation’s movements or preventing Hamas officials from returning home. As Al-Ahram Weekly went to press on Tuesday evening most Hamas officials had left Cairo though Gaza-based Ismail Haniyeh, head of the movement’s political bureau, remained in the Egyptian capital. On Sunday an Egyptian delegation, led by Sameh Nabil who oversees the Palestinian dossier in the GI, arrived in Gaza via the Erez border crossing between Israel and the Strip to push for implementation of the reconciliation agreement. The Egyptian delegation “will see that words become action and that the other side [Fatah] also becomes part of the agreement,” said Al-Nunu. The reconciliation deal seeks to end more than 10 years of Hamas-Fatah rivalry. Following its election victory in 2006 Hamas engaged in a violent confrontation with the ruling Fatah faction, seizing control of the Gaza Strip in 2007. This led to the creation of separate Palestinian governments, one in Gaza, the other in the West Bank. Israel responded by imposing a sea, air and land siege of the Strip, restricting healthcare, energy, food supplies and movement, leading to a dramatic deterioration in the conditions faced by Gaza’s population of two million. The United Nations says the Strip has become “unlivable”. In 2015 Palestinian Authority President and Fatah leader Mahmoud Abbas appointed the Rami Hamadallah cabinet, which Hamas refused to recognise. Instead it created a de-facto ruling entity for the Gaza enclave, commonly referred to as the administrative committee. As part of its efforts to implement the Cairo-sponsored reconciliation agreement the Islamic resistance movement has dissolved the committee and invited the Hamadallah government to take over ministries in Gaza. In signing the agreement, Hamas and Fatah pledged to re-install the Palestinian Authority to Gaza by December 2017, following a series of steps which included, among a host of other issues, merging the two security apparatuses, integrating into the government thousands of civil servants appointed by Hamas over the last decade, and managing taxes and border control. Forming a national unity government and holding general elections were supposed to follow. Yet four months on both sides remain mired in the initial steps and are busy trading accusations of noncompliance. In April 2017, to punish Hamas PA Chairman Abbas lashed the salaries of PA civil servants in the Strip and asked Israel to reduce electricity supplies. There appears to be little change in his hardline stance. While Egypt’s involvement in inter-Palestinian politics isn’t new, Hamas’ extended stay in Cairo, which has now entered its third week, is unprecedented. 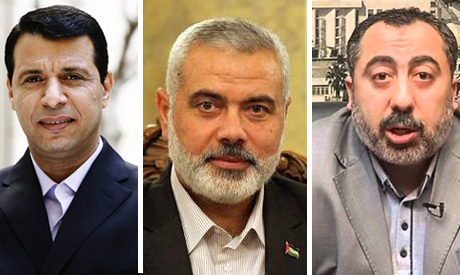 The duration of the stay and the growing size of the high-level delegation — which in addition to Haniyeh included senior figures Moussa Abu Marzouk, Ezzat Al-Reshk and Salah Al-Arouri, the man who founded the Ezzeddin Al-Qassam Brigades, Hamas’s military wing — has raised questions on the motivation behind the meeting. Sources in the Israeli press claim Egypt and Hamas have discussed prisoner swaps with Israel and the GI is pressing the group’s senior figures to unilaterally hand Gaza to the PA.
“None of this is true. Cairo has been excellent with us,” said Al-Nunu. He told the Weekly intelligence officials had pledged to open the Rafah-Gaza border — the enclave’s only gateway to the world not under Israel’s control — for longer durations, “and to open it on a daily basis, soon”. Palestinians complain the Rafah border crossing, controlled by Egypt, is not open for people and goods frequently or long enough. In 2017 Egypt opened the crossing for less than 20 days, less than half of the 48 days it was open in 2016. In a sign of rapprochement with Hamas Egypt has opened the crossing twice this month: for four days beginning on 21 February, and for three days beginning on 9 February. According to Al-Nunu, Hamas has discussed a “roadmap” with the GI to implement the reconciliation agreement though he refused to elaborate on its content. Meetings have also discussed improving bilateral relations with Egypt and reasserted, under the GI’s new leadership of Abbas Kamel, the commitment of both sides to the creation of a Palestinian state based on the 1967 borders with Jerusalem as its capital, and the right of return for Palestinian refugees. They have, too, addressed joint security cooperation at the border and ways to ease the suffering caused by the Israeli-imposed blockade of Gaza. During its first week in Cairo the Hamas delegation met with aides of former Fatah security official Mohamed Dahlan, the exiled political rival of PA Chairman Abbas. Dahlan, 57, a self-proclaimed leader of the reformist current in Fatah who is backed by the United Arab Emirates, arrived in Cairo on Monday where he has been giving media interviews critical of Abbas. “Our meeting with Dahlan’s aides is part of our efforts to improve relations with all sides, including Fatah’s reformist current,” said Al-Nunu. As former security chief in Gaza Dahlan was the arch enemy of Hamas, ordering the arrest and torture of many of the group’s members before 2006. Now he is an unlikely ally of a movement desperate for any level of support that might help prevent the Gaza Strip from imploding. Last summer Dahlan said he had secured funds for a power plant in Gaza after attempting — unsuccessfully — to negotiate a deal with Hamas and Egypt to open the Rafah crossing. In an interview with an Egyptian TV station on Monday Dahlan described the Palestinian leadership as a burden on Palestinians. “I’ve never seen a government, no matter how corrupt or fascist, punish its people the way the Palestinian Authority is doing in Gaza,” he said.